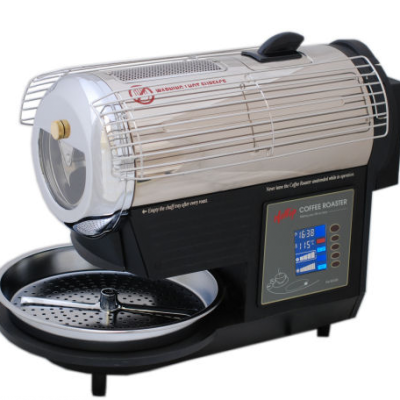 The KN-8828B-2K+ is more than just an update of the KN-8828B-2K which has been the coffee roaster to which others are compared. While maintaining the various safety features of previous models, the “KN-8828B-2K+” control panel has been designed from the ground up to be the most sophisticated control system that Hottop has ever offered. 1) The timer now can be set by the user to count up as well as count down! 2) Bean temperature is now displayed. The color changes to this brown tone right around the time of first crack. 3) And now, environmental temperature is now displayed as well! Dual temperature displays using our newly designed K thermocouples. 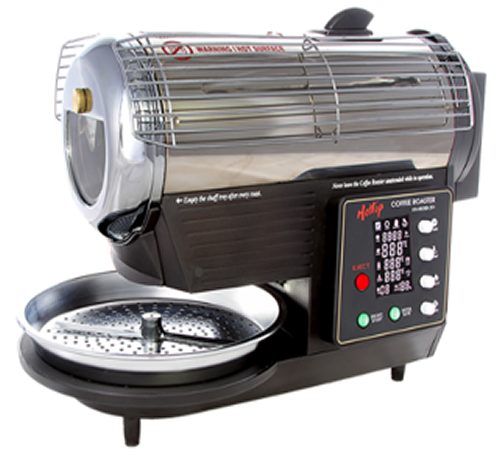 The bean thermocouple has been placed so that it is immersed in the bean mass throughout the entire roast for greater accuracy and more consistent results. 4) Bean temperature is now used for the Target temperature (maximum is set by the user) and is displayed separately. 5) All adjustments are now done using four knobs. Turn clockwise to increase a setting, counter-clockwise to lower. They have infinite rotation and are speed sensitive as well. No more pushing buttons or selecting a parameter before adjusting! No "up and down" arrows to deal with! The time and temp (the two top knobs) set the maximum targets for the roast. The Heat and Fan knobs (bottom two) are dedicated to those functions. Temp in 1% increments and fan speed in 10% increments. All settings are available at any time throughout the roast. 6) USB! Yes, the KN-8828B-2K+ has a USB port located on the side of the control panel. Aritsan has been modified to accept the KN-8828B-2K+ and that version is available as of 5/15/15!